When I talked to the Long Island Modern Guild last month, one of my big tips was share your work. You never know what will happen. But I haven’t been following my own advice. I’ve been hiding a project that has no reason to be hidden. It’s not for a magazine or a show (though I’ll enter it someday). I was afraid that what I was trying wouldn’t work. I got a little too precious about this project that has taken me hours and hours of quilting. I was afraid that one wrong move could make the whole thing turn south. But now I realize how silly my fear makes me. I’m saving the full reveal for when the quilt is done, but I’m ready to share some detail shots. And I’m realizing that keeping the work to myself has been really lonely (this could have been partially caused by the funk). I’ve shown a bit of the matchstick quilting in a previous post, along with the million threads that I had to bury along with it. the reason that I had to bury the threads is because the portion that is matchsticked is inset into some really delicious gray heather flannel. And on an impulse, I decided to hand quilt the flannel. (Insert Edvard Munch Scream emoji here.) It’s a huge undertaking, but once I thought of it, I knew it had to happen. I’ve been admiring hand-quilted work for ages and taking in as much information about it as possible. Yes. I know. 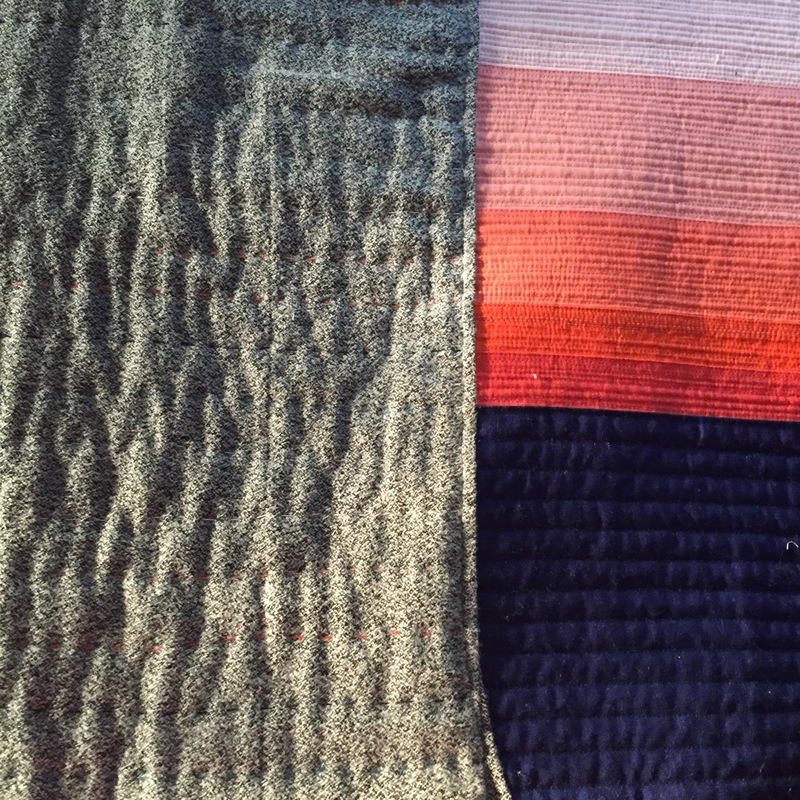 This quilt combines two of the slowest quilting methods on the planet. But I think this was meant to be. I’m learning a lot about my own patience and how to really put a lot of work into something to make it special. In the past I have just tried to get things done, and this quilt is about paying close attention to details. I love how this shot in evening light shows the contrast in texture. I thought this quilt was going to be all about color, but this choice has made it about texture too. Stay tuned. Show your work. I’ll keep showing mine. I am loving all the progress pictures that you are sharing of this quilt, Melanie. The texture is definitely inviting! I tend to laugh at myself when I offer up a bit of advice… only to immediately realize I am not doing that very thing myself. Life has a funny way of giving us mirrors sometimes. LOVE this work! I couldn’t agree more about sharing. I tend to hide half the stuff I am working on, and then when I finally put it out there, I worry that I’ve overshared…or said the wrong thing. I probably don’t share half of what I do — mostly just because by the time it’s photographed and blogged, I’ve already moved onto the next project! 😀 Loving these sneak peeks, and good for you for sticking to your plan! oh man I just can’t wait to see this quilt in it’s full, finished glory! You’ve put so much thought, time and energy into it, it is sure to be amazing.